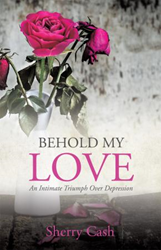 Sherry Cash’s new book, BEHOLD MY LOVE - An Intimate Triumph Over Depression, ($10.99, paperback, 9781498447133; $5.99, e-book, 9781498447140) tells her remarkable story of overcoming depression with help from Christ – and specifically through His Word, the Song of Solomon. Struggling through a time of deep depression in her life, she began reading the Song of Solomon. There was a specific verse – Song of Solomon 2:13 – that was brought to her attention by the Holy Spirit. It became her mental and emotional stabilizer and tranquilizer – her life’s salvation. She began to understand that Jesus called her His love, His fair one. He wanted her to “come away” with Him. She read through the Song of Solomon over and over again during that time – a blessed time. Jesus led her through this very trying ordeal through His Word – and inspired her to share her intimate relationship with Him – in this wonderful book. “If my book helps even one person can get victory over depression, then it will be worth it,” states the author. Sherry Cash has a Bachelor of Religious Education. She has written Vacation Bible School lessons, taught Sunday school and at Arlington Baptist College, she taught a Writing Class about getting a school yearbook published. She is no longer in depression. She has fallen in love with Jesus Christ. Xulon Press, a division of Salem Media Group, is the world’s largest Christian self-publisher, with more than 15,000 titles published to date. Retailers may order BEHOLD MY LOVE - An Intimate Triumph Over Depression through Ingram Book Company and/or Spring Arbor Book Distributors. The book is available online through xulonpress.com/bookstore, amazon.com, and barnesandnoble.com.